American teachers are less enthused about their jobs than are local politicians or active-duty military personnel, according to the 2018 EdChoice Schooling in America Survey. After a year that saw educators revolt over low pay and teachers unions seriously weakened by a landmark Supreme Court decision, the survey also found the profession disillusioned with parents and school boards. This is the sixth edition of the annual poll, which measures public attitudes on schooling options, school quality, and state and federal education policy. EdChoice, an Indianapolis-based research and advocacy group, tends to favor school choice options such as private school vouchers or education savings accounts. The poll’s 2018 iteration is the first to include the voices of teachers. Survey administrators conducted online interviews with 777 traditional public school teachers (i.e., active instructors working exclusively in district schools, not charters) about their feelings toward the job, this year’s wave of mass walkouts, and their level of trust in key figures in public schooling. The results were bracing. Overall, teachers were unlikely to recommend teaching as a profession. To rate job satisfaction, EdChoice relied on a metric called Net Promoter Score, a calculation designed to measure how likely a customer would be to continue to buy a given product and urge others to do so. On a 10-point scale, respondents who rate themselves a nine or a 10 are considered “promoters,” who will loyally stump for a product or service; those who rate a seven or eight are so-called “passives,” who could be lured away by a competitor; and anyone rated six or below are “detractors,” unhappy consumers who pose an active threat to the brand through bad word-of-mouth. When asked by EdChoice whether they would recommend teaching in a public school to a friend, a full 74 percent of respondents were measured as either passives or detractors. The median score for teachers was just a 6.49 — much lower than comparable ratings for state legislators (8.19) or military service members (8.41). The survey authors wrote that they were “shocked” by the level of dissatisfaction. 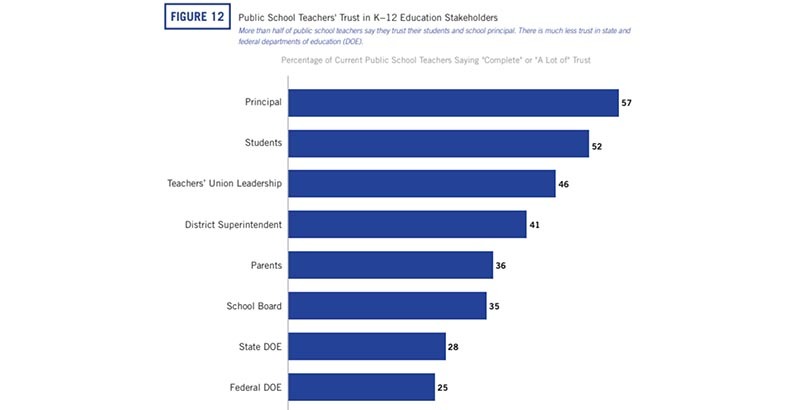 Additionally, few teachers said they placed much trust in education stakeholders outside their building. 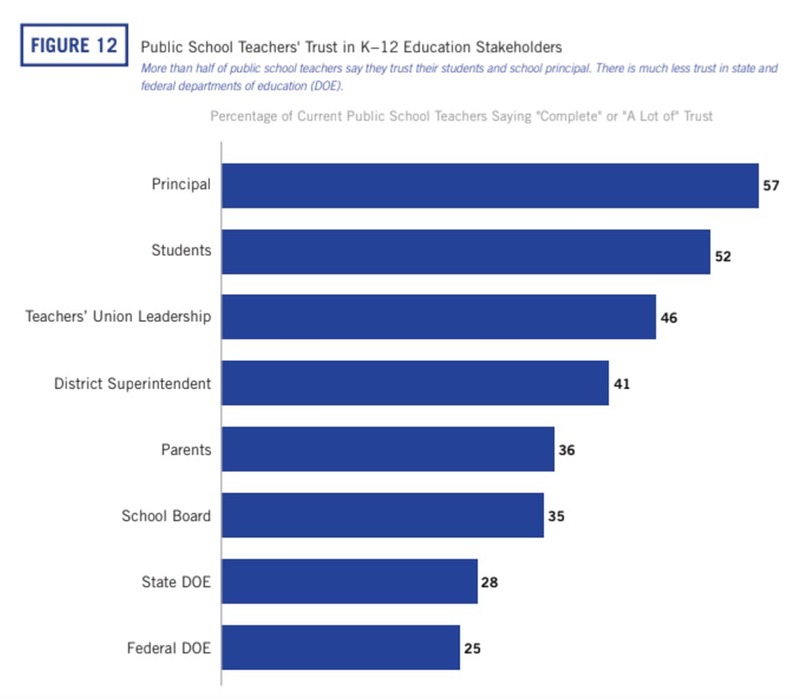 While a majority of teachers said they had “complete” or “a lot of” trust in their principal (57 percent) or their students (52 percent), less than half said the same of their union leadership (46 percent) or their district superintendent (41 percent). Parents won a great deal of trust from only 36 percent of teachers, while state and federal education authorities were both mired beneath the 30 percent mark. ● Fifty-five percent of the general public — a selection of 1,002 respondents independent from the teacher sample — said that public education in the United States was headed on the “wrong track,” the same percentage as in last year’s survey. Thirty-five percent said the opposite, an eight-point increase since 2007. ● Many parents report making considerable sacrifices for the sake of their children’s education. Some 40 percent reported taking on an additional job to support their kids’ schooling needs, nearly twice as many as when EdChoice asked the same question in 2016. Thirty percent said they had changed their jobs, while 29 percent said they had moved closer to their kids’ school. ● Even as many expressed pessimism with America’s education system overall, most parents said they were satisfied with their own children’s schools. Eighty-six percent of homeschool parents, 79 percent of private school parents, 78 percent of charter parents, and 66 percent of district school parents said they were satisfied with their schools.